About 150,000 years ago, along the Congo River, a tryst with a long history took place. Chimpanzees and bonobos two distinct groups of great apes that share almost all of their DNA with our own species got together, causing their genetics to become somewhat entwined. Writing in the journal Science, an international team of geneticists explain that this cross-breeding first occurred sometime between 200,000 and 550,000 years ago. The cumulative effect of these two phases of friskiness mean that certain groups of modern chimpanzees derive 1 percent of their genetic material from bonobos. This study was conducted as part of a conservation effort to better clarify the genetic distribution of both apes. Both are endangered. A truly accurate assessment of their numbers can't be conducted without knowing how their DNA is spread over the continent. By analyzing the entire genomes of 75 chimpanzees and bonobos from 10 countries, the research team could work out whereabouts they'd migrated to and from over the course of their evolutionary history. This is the largest analysis of chimpanzee genomes to date and shows that genetics can be used to locate quite precisely where in the wild a chimpanzee comes from, study co-author Dr Chris Tyler-Smith, an evolutionary geneticist from the Wellcome Trust Sanger Institute, said in a statement. This can aid the release of illegally captured chimpanzees back into the right place in the wild and provide key evidence for action against the captors. Apart from their cross-breeding, the team were startled to discover that they'd repeatedly crossed the enormous Congo River, which was previously thought to be a powerful barrier to any such unions. Its reasonable to assume that [back then] the river might've looked very different to how it does today, maybe allowing the populations to meet, lead author Dr Toms Marqus-Bonet, a researcher from the Institute of Biological Evolution at Pompeu Fabra University, told IFLScience. Diverging from a common ancestor around 1.5 million years ago, bonobos (Pan paniscus) and chimpanzees (Pan troglodytes) are scattered across Africa to varying degrees. 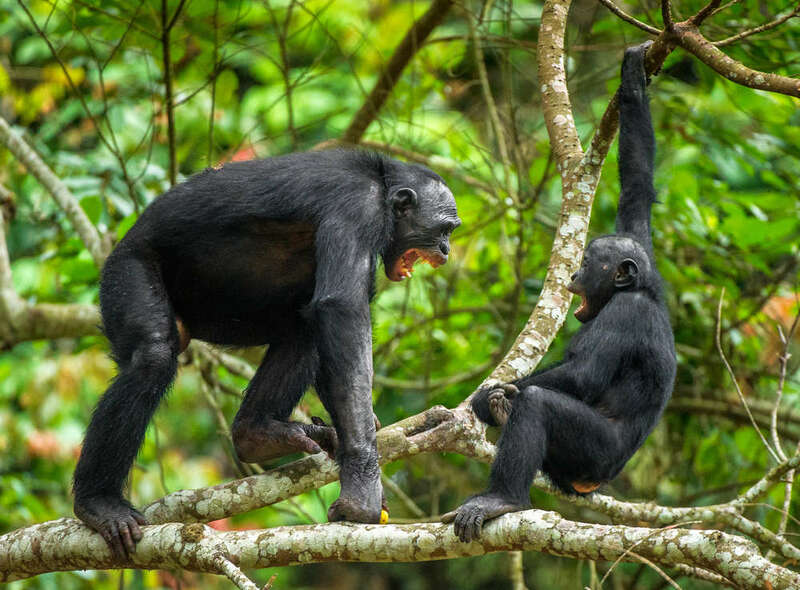 Despite some sociological differences chimps engage in limited warfare and are male dominated, whereas bonobos are female dominated and far more passive. Example their genomes are 99.6 percent identical. Chimpanzees, of which there are now four confirmed subspecies, are distributed across western, eastern. Central Africa, north of the Congo River. The central and eastern chimp subspecies are located on either side of the bonobo heartland, which lies within the humid forests of the Democratic Republic of the Congo on the south side of the Congo River. Its been thought that the split from the common ancestor occurred when two populations split up, with one occupying territory to the north and the others sticking to the south. Divided by a powerful river, the two groups evolved into brand new species in a classic example of a mechanism known as allopatric speciation. However, this research makes it clear that, at least twice, chimpanzees and bonobos crossed paths via the Congo River in order to explore similar territory, find new resources. Apparently have a fling or two. Specifically, it appears that the central and eastern chimpanzees share significantly more genetic material with bonobos than the other chimpanzee subspecies, suggesting that these groups were more adventurous in their cross-river wanderings than others. As a result, their genomes have been contaminated by each other to a small degree something that mirrors the mingling of Neanderthals and humans long ago. In fact, this is the first study to reveal that ancient gene flow events took place between the two living species most closely related to humans, something that may have been more common among our ancestors than previously thought.